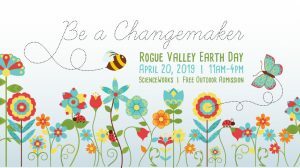 Siskiyou Velo will have a booth at the Rogue Valley Earth Day at ScienceWorks in Ashland on April 20, 11am – 4pm, to promote bicycling as a means to reduce carbon emissions, invite new members to the club, and increase awareness of our education programs and advocacy efforts. Volunteers are still needed for this event and also for future events. If you would like to volunteer, respond to Ann Smith at advocacy@siskiyouvelo.org.